The worst happens—your relationship ends and you’re clueless about what you did wrong?? That’s because most men don’t notice that they’re being tested by their women during the course of their relationship. So, here’s news for you! These tests are crucial. They go a long way in determining your position in your woman’s life. Let’s see how. In this post, I will be sharing some insights on how women TEST men and why women test men in the first place? 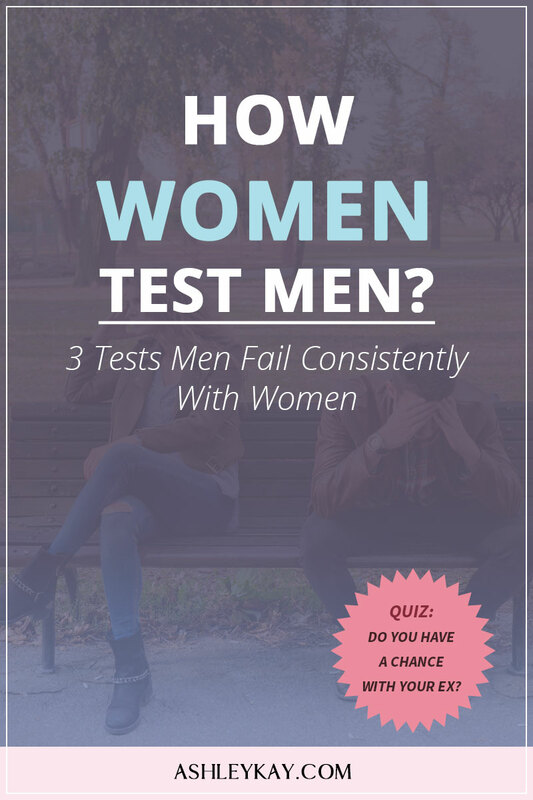 We’ll also talk about the 3 main tests that men usually fail. But before we get there, let us first understand why women test men? From an evolutionary point of view, women have it in their DNA to test men. They do this without realizing it themselves. Since the woman engages in birthing and raising the offspring, as well as looking after her surroundings, the duties of her man are strictly laid out— like being ‘The Leader’, who will provide resources for food, shelter, comfort, and safety. The need for survival for a woman amongst her tribe is solely dependent on her MAN. Therefore, she needs to be sure that she has picked the right man for this role and making sure that this investment will benefit her greatly in the long term. The Woman is an intuitive being, who will put her man through various tests. If you FAIL, she may give you the occasional benefit of the doubt, but don’t take those for granted. Unlike a video game, you don’t get unlimited chances here. So, how do women test men? How does one see them coming? And how does one tackle them? Let’s get into understanding these tests. You’re wondering, such a simple question only demands a simple answer, right? Men miserably fail at this test when they are not indecisive or throw the question back at her, “I don’t know, what would YOU like to eat?”… This is an INSTANT FAIL. Women generally like it when men take the LEAD. Not only are you directing her and getting into immediate action, but you’re also taking her on a little adventure. You’ll earn brownie points for taking charge! So, next time you hear her say, “What movie do you want to watch?” or “What do you want to do this weekend?” you know exactly what to do! Make a decision or give her a few options to pick from. As humans, we are different and not perfect. Highlighting insecurity of a partner can become a bone of contention in any relationship. How should a man respond to something like that? Well, how a woman tests her man is another way to gauge how invested a man is in making her feel important. As said before, if she picks you then it’s for a long haul and needs to be sure that you’re committed. Questions like these are a sign that her insecurities were triggered and she’s putting it to you to “make her feel better”. It’s always best to reply with a compliment telling your girl that she is the prettiest, sexiest, smartest, and the most amazing creature in the world. Where some men go wrong is when they tell a woman that they have “doubts” but continue to be in the relationship whilst telling her that they still have feelings. It’s this kind of inconsistency, which will drive a woman’s insecurity through the roof. If you do have doubts, talk about it and try to RESOLVE it. An insecure woman in a relationship will not only be unpleasant but will be PAINFUL for you. Try this with caution as this mainly depends on the relationship dynamics that you two share. If you accidentally trigger your woman’s insecurities, her reactions and behavior towards you are going to be pretty obvious and not in a good way… She’s going to subconsciously punish you for triggering her insecurities, either by causing an argument or being very “snappy” or “challenging” in her tone. She’s telling you she doesn’t like how you’re making her feel, and that you should “not do it next time”. So, how should a man tackle this? Chasing after her, apologizing or simply shutting down are common ways men deal with this. But it’s often the WRONG way. By being scared of her emotions (hiding from her) OR trying to placate her, you’re showing you’re weak and will do anything to make her happy. Unfortunately, although she may get what she wants and feel “better” in the moment, in the long run, she’ll start to think you’re a weak man and not as strong as she thought you were. This will automatically make her throw you another test. What she is looking out for is for somebody to STAND UP TO HER. So, what is the best possible way to respond to such a situation? Take your cue from when she starts to get emotional. When you see a situation turning into an argument, here’s what you need to do. Look her in the eye, tell her she’s not in a good state right now and you’ll talk once she settles down. Then drop it and walk out of the room. Be firm or she’ll never take you seriously. This way, you’ll prove to her that you’re a STRONG MAN and are not willing to take her nonsense. If you show any sign of inconsistency, it will give her a reason to test you further! So, try and stay consistent. Your relationship will work out wonderfully as long as you resolve situations by being consistent from the beginning. So, now that you’ve learnt about all the different kinds of test, all you need to do is be attentive and recognize when she shoots a test your way! ALL THE BEST! Miss your ex? Why not take my short 6 question quiz and discover whether you really have a shot at getting them back. The answer may surprise you! Click here to take quiz. Take this short quiz: Can You get your ex back or is he gone forever? Previous Post: « Will Your Ex Forget About You During No Contact?